The Cutty Sark was launched 1869 in Dumbarton, Scotland. In tea trade until 1890, she took part in the tea clipper races from China to London which made her famous and gave her a legendary reputation. After that she was used for general trade and wool transport. She won all of the wool races she took part in and set several speed records. In 1954, after many years as a stationary training ship she was moved to a purpose-built dry-dock in Greenwich and preserved as a museum ship. During repair works in May 2007 the ship caught fire and was considerably damaged. However, after reviewing the damage and successfully raising funds it was decided to restore the ship completely. She was opened to the public again in 2012. In Wikipedia there is a detailed account on the Cutty Sark. The restoration work and how to visit her is shown on the webpage of the Cutty Sark Trust and the Royal Museums Greenwich. I took many photographs of the ship on a visit in April 2014. 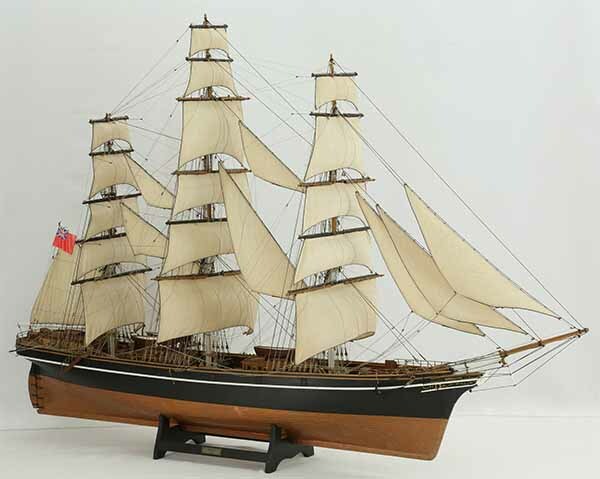 The ship model was built with sails that exquisitely show the wind blowing. The elegance of the fine hull is well presented. 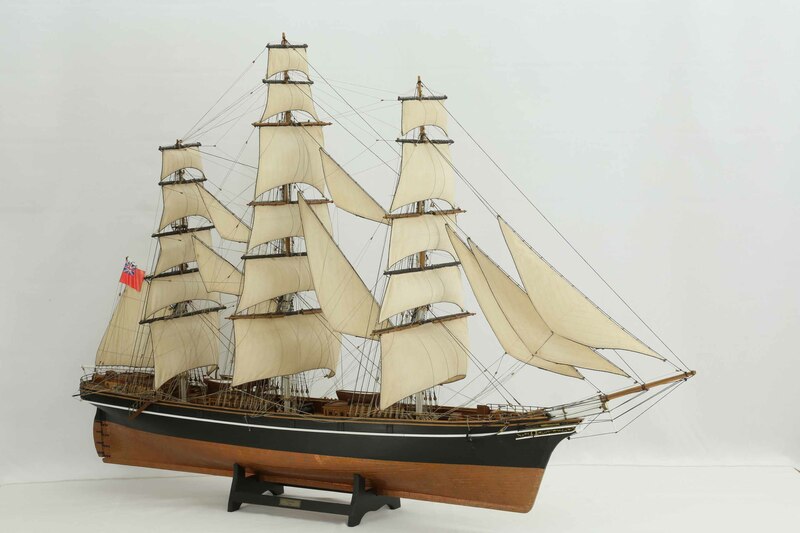 This model of the Cutty Sark is a beautiful, fine piece of work. The ship model is 1 : 78 scale. Length is 116 cm, width 37 cm, height 80 cm. The model is not fixed to the stand and can be taken out, i.e. for transport. The price of the model is 3800 Euro, plus transport cost.